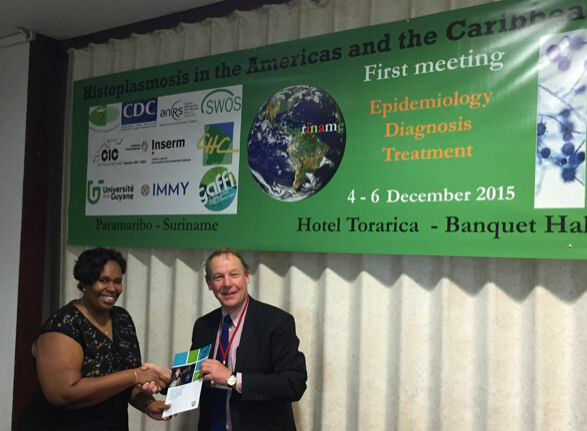 At the first ‘Histoplasmosis in the Americas and the Caribbean Meeting’ in Paramaribo Suriname, representatives from Latin America shared the dramatic problems of disseminated histoplasmosis in AIDS. The histoplasmosis problem exceeds the TB problem in many regions, and dwarfs malaria (<100 deaths annually across the Americas). One in 3 or 4 new AIDS admissions in multiple hospitals across the region have disseminated histoplasmosis, based on the highly sensitive antigen test. Representatives from French Guiana, Surinam, Guyana, Venezuela, Trinidad, Panama, Guatemala, Mexico, USA, Brazil, Argentina and Colombia shared their experiences and formulated advocacy and research plans to address the major problem of delayed diagnosis of histoplasmosis. Most patients who develop histoplasmosis in AIDS are aged between 25 and 40 years old. In Panama, 59% of these patients died. “Introduction of an ELISA assay for histoplasma antigen in urine in Guatemala reduced deaths by 30%”:, stated Dr Eduardo Arathoon of the Asociacion de Salud Integral. Dr Beatriz Gomez from Medellin noted that: “Histoplasma antigen is detectable with a 85% sensitivity in urine.” Exciting early data of a point of care lateral flow test for histoplasma antigen was shown, which could be a ‘game changer’, according to Dr Tom Chiller of the US Centers for Disease Control. UNAIDS included a target of fewer than 500,000 deaths from AIDS by 2020, aligned with GAFFI’s Roadmap call for a focus on reducing deaths by diagnosing and treating fungal infections. Attendees at the conference did not believe this would be possible without addressing histoplasmosis, and enabling diagnostic testing throughout the region. The burden of histoplasmosis is not known in most localities, because few laboratories are equipped to undertake diagnosis and culture is extremely slow and insensitive. Co-infections of histoplasmosis and TB are seen frequently together (25-33% of disseminated histoplasmosis cases in AIDS), and pose a problem for treatment because of drug interactions. The contrast between the 3 countries of the Guiana Shield could not be greater. French Guiana (an overseas department of France), has well equipped laboratories with antigen, molecular and conventional diagnostic testing, as well as liposomal amphotericin B and itraconazole for therapy. Suriname has access in the capital Paramaribo to conventional diagnostic testing, as well as standard amphotericin B and itraconazole. In contrast, Guyana has almost no diagnostic capability and neither amphotericin B or itraconazole.